The Army and Navy Chronicle, has a plethora of information on the Seminole War. The ANC was a weekly journal printed from 1835-1842. Since the big event at the time was happening in Florida, then the Florida Seminole War gets a lot of attention. I found much information on Major Dade and his defeat. Then I found more, which led me to search elsewhere and to look up Dade’s genealogy, with some surprises. Major Francis Langhorne Dade is the Florida version of George Armstrong Custer. He is better known for his death than anything he did with his stagnant military career. Forty years before Custer's disastrous campaign and defeat in 1876, Major Dade held the honor of most recent ambush and sound defeat by Native American Tribes. Soldiers being defeated by Native Americans was nothing new. St. Claire's defeat in 1791 killed a thousand soldiers, and Dudley's Defeat during the War of 1812 at Fort Meigs also killed hundreds, as did the River Raisin Massacre, also during the War of 1812. Look up those incidents if you never knew about them; it's great reading! After the War of 1812, things had changed. The Army became better disciplined regulars. Now when they were defeated and obliterated, people took notice. Which is why Major Dade's battle was news, because it was all trained regulars. And ironically 10 years earlier, Captain Dade had taken a small force and built the Fort King - Fort Brooke Road that he was later killed upon, but did not face any trouble that first time. So with Dade's disastrous ambush and defeat, he has forever become the one we like to ridicule and mock. Seminole Tribe's Moses Jumper, Jr., has written a book of poetry, which has a poem about Dade, which basically says, "We're glad that you died!" But, you know all of this. What I learned in the Army & Navy Chronicle, was that there was another officer named Dade who also had an inglorious end to his military career during the 2nd Seminole War. In February 1840, Captain Townshend Dade of the 2d Dragoons, was court marshaled and separated from the service. The reason was not given, so it was most likely some juicy moral sin of a night of drinking and debauchery in St. Augustine. Townshend died the next year at age 30 and is buried in the Congressional cemetery in Washington. I thought that this was worth investigating, because the name Townshend is a name common in the Dade family genealogy. I found the Dade Genealogy several years back in the Orlando library. They were a famous Virginia plantation family with connections to George Washington. And as most elite families of the upper class, had incestuous relationships where first cousins marrying was not uncommon. So I wanted to find out how Captain Townshend Dade was related to the better known Major Francis Dade. What I found out was more than I bargained! The Dade families are descended from the first Dade who came over the big pond and purchased land in Virginia known as the "Townshend Patent." Coincidentally (or not), this first Dade was also known as Major Francis Dade (1621-1663). His son, also named Francis Dade (II), (1659-1694) married Frances Townshend. So these names are common in the family. Below: Major Dade's first cousin, General Lawrence Taliaferro Dade; a veteran of the War of 1812 and later general in the Kentucky Militia. We don't have any portrait of Major Dade, so this is the nearest I was able to find, on Wikipedia. Lawrence and Francis L. Dade were very close, went to school together, and practiced law together in Virginia briefly before the War of 1812. Our well-known Major Francis Langhorne Dade (1792-1835) is fifth generation Dade, or the great-great-grandson of the family progenitor. First arrival, Major Francis Dade (1621-1663), had a son who was also named Francis, who had a wife named Frances. Isn't that a little confusing? But it doesn't get any better. 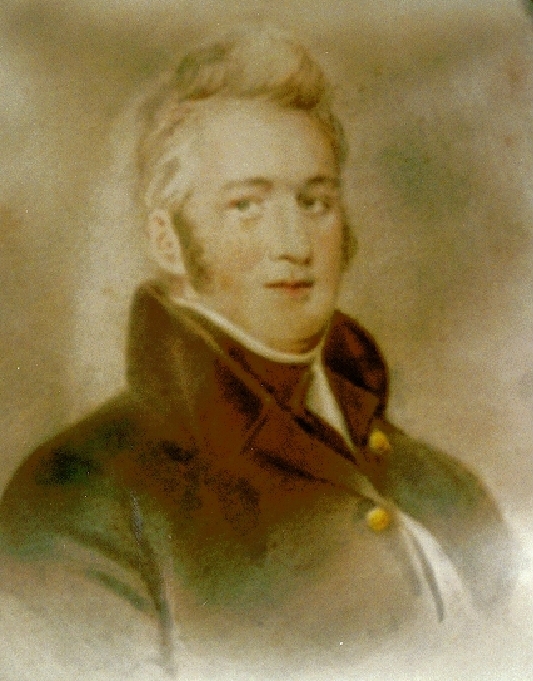 Francis II had a son Cadwallader Dade (1693-1761), who then had a son named Townshend Dade (1760-1808), who was the father of Maj. Francis Langhorne Dade (1792-1835). Our sinner who was court marshaled out of the Army in 1840, Capt. Townshend Dade (1810-1841) is seventh generation from the original Francis Dade, so the easiest way to say it, is that he is a distant cousin of our forlorn Maj. F.L. Dade. We do not know if he closely knew his distant grand uncle. It's a confusing line, so easier if I skip the details. Then to my utter surprise and shock, my favorite officer of the war, who was the war historian and eyewitness who published the 800-page history of the Seminole War in 1848, Capt. John T. Sprague (1810-1878), had a daughter Josephine (1863-1939), who married into the Dade family. Josephine Sprague married General Alexander Lucian Dade (1863-1927). But fortunately, Gen. A.L. Dade is even further removed from Maj. F.L. and Capt. T. Dade. He is Ninth generation from the original Major Francis Dade. So you have to go six or seven generations back for a common ancestor. But then looking in the Dade genealogy, I found the icing on the cake. When I came across this name, I stopped for the day, put away my notepad, and did not look up anything else historical the rest of the day. This final Dade that I want to mention is eighth generation from the original Maj. Francis Dade, and has to go back about five or six generations to connect with the other Dade’s. This one was named Osceola B. Dade, born around 1868. Wow. A Dade family member named after Osceola!